If you have walked down Park City’s historic Main Street before you’ve probable seen the famous No Name Saloon and if you’re smart, you’ve been inside and enjoyed one of their burgers! Year round, any day of the week, you will find No Name packed with visitors and locals hungry for one of their epic burgers and homemade chips. Now you might be saying, a burger is a burger- what could be so special about this burger? First off lets just say all burgers are not equal! The No Name starts off with lean Bison meat and fresh toasted bun, from there you’ve got 5 options or build your own… if you love bacon and bleu cheese, go for the bacon bleu cheeseburger or if you’re looking for some spice the No Name Burger with freshly sliced jalapeno is the way to go. Personally, my favorite is the Zesty Red Cheeseburger, it is flavor packed and topped with caramelized onions and red peppers then finished with pepper jack cheese for some added spice! It might be a little dramatic to say but this burger will change your view on life. So I’ve decided to recreate my favorite burger at home but with a little twist. Instead of topping the burger with onions, peppers and cheese, how about stuffing all that goodness inside the burger? Well I gave it a shot and let me tell you, it delicious! Now whether you’re in Park City or home in your own kitchen, you can enjoy a delicious Zesty Red Burger anytime! Enjoy! 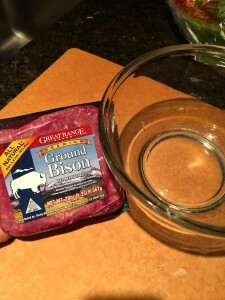 In a medium bowl, combine bison meat, cumin and Worcestershire sauce. Using your hands mix the meat until fully combined. 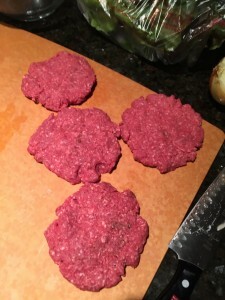 Break the meat into 4 equal balls to form patties. Set aside. In a saute pan, heat 1 teaspoon olive oil. Add sliced onions and cook until caramelized and golden brown, about 5 minutes. 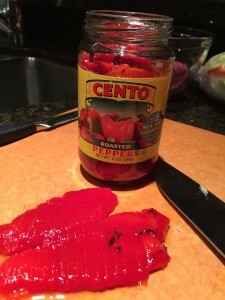 Remove from heat and mix in red peppers. 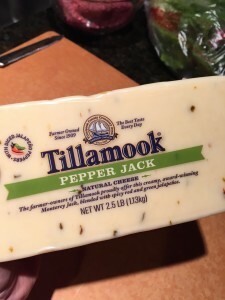 Place one slice of pepper jack cheese on top of two patties, then divide the onion and pepper mixture evenly between the two burgers. 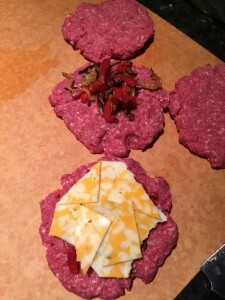 Take the other two patties and place them on top to form a “sandwich”. 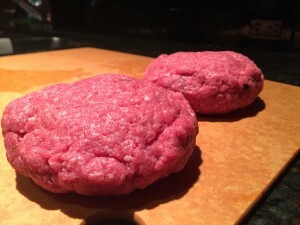 Carefully pinch the edges of the two burgers to form one larger stuffed burger. Place the burgers on the toasted buns and top with tomato and lettuce. Serve immediately. This recipe was published on the Dishing PC website. 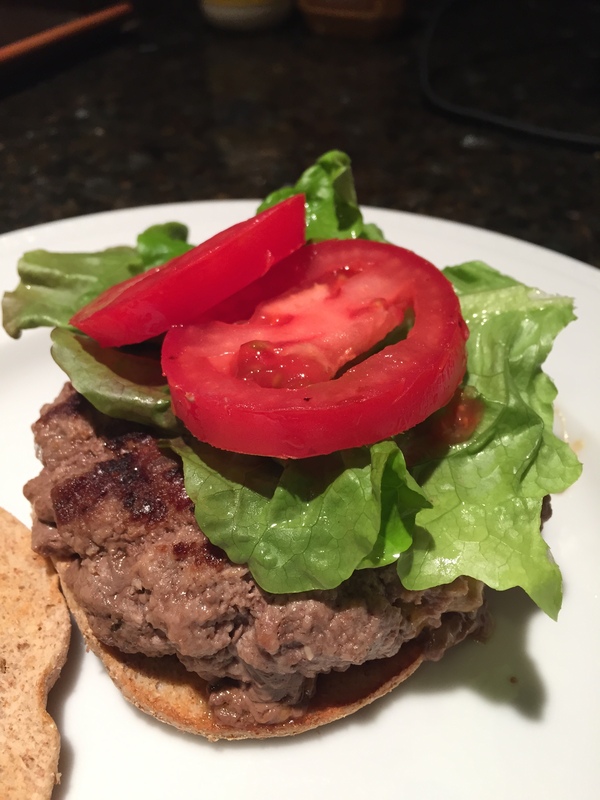 This entry was posted in Entrees, Recipes and tagged No Name Burger, Zesty Red Burger by skibootsinthekitchen. Bookmark the permalink.